Health has always been an important facet in Erie County’s Polonia. Because of the language barrier, Poles visited their own to secure good medical care. From the pioneering midwives, to Angela Smeja and other early nurses, and if needed, Francis Pitass and Francis Fronczak, the first doctors of Polonia; if one was sick, help could be found. As health and medical care evolved, many early Polish leaders wanted to build a modern hospital for the community but the project would take longer than any of them expected. The first idea of a hospital for Polonia began in the waning years of World War I. The Franciscan Fathers, based out of Corpus Christi Church, saw the need for a medical facility in Buffalo’s East Side and started looking into possible solutions. In the mid-1920s a feasibility team from Chicago was assembled and after looking at the information the Franciscans had gathered, determined that a hospital wasn’t truly necessary. For almost a quarter century the desire for a Polish hospital simmered just beneath the surface for the Francisicans, until Father Justin Figas rekindled the idea in 1945. Working with Dr. Edward Bukowski the duo came up with a plan for a 150-bed hospital on Harlem Road with an estimated cost of one million dollars. With the help of Mathew Karpinski and Casper Urban an Ambassadors Committee was formed to help raise the money needed, which was soon followed by the Woman’s Guild. By 1946, attorney John S. Ryan was general chairman of the intercommunity hospital fund, key leaders including Cheektowaga Supervisor C. Chase Zalemski, Lancaster Supervisor Stanley J. Keysa, Dr. Stephen A. Graczyk, were raising $300,000 and securing a 26-acre site on Harlem Road. The next year John A. Ulinski was chairman and the fundraising goal was $500,000 but as the project rolled into the 1950s the pep and enthusiasm began to dwindle. Fundraising slowed down as organizational duties had to be sorted out. In 1954, the Franciscan Sisters of Saint Joseph were named as the administrators and the St. Joseph was chosen as the name for the Intercommunity Hospital. It would be the sisters who would give the hospital the fundraising shot in the arm it needed when Mother Leona donated the $170,000 they had saved for a new motherhouse. This spurred the community and by the end of the year over $768,000 was in the coffers. With this base fund, architect Joseph Fronczak was hired to design the slightly scaled down 112-bed hospital. On May 14, 1957, ground was broken and construction began. It would take almost three years to complete the building, but as the finishing touches were being added, the new staff was being vetted. Of the five key staff position, Poles were charged with two, Dr. Thaddeus J. Bugelski as Head of Obstetrics and Gynecology and Dr. Henry V. Morelewicz Head of the Ancillary Department. On August 25, 1960, Bishop Joseph A. Burke dedicated the building in front of a crowd of 700. The only person missing was the man who conceived St. Joseph’s Hospital, Father Justin Figas, who passed away October 23, 1959. 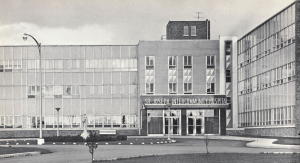 After nearly 40 years of work, fundraising, and preparation, St. Joseph Intercommunity Hospital accepted its first patient on September 8, 1960. Since then, it has become a keystone in not only Polonia but Western New York’s health community. "200 Honor Father Figas." Buffalo Courier-Express [Buffalo, NY] 15 Sept. 1954: 4. Print. "$768,916 Pledged In Hospital Drive." Buffalo Courier-Express [Buffalo, NY] 19 Dec. 1956: 32. Print. "Bishop Plans To Dedicate Hospital." Buffalo Courier-Express [Buffalo, NY] 23 Aug. 1960: 13. Print. "Franciscan Nuns Donate $170,000 Savings to Fund for Hospital." Buffalo Courier-Express [Buffalo, NY] 25 Nov. 1956: 45-D. Print. Froehlich, Walter. "New Hospital Is In Full Swing." Buffalo Courier-Express[Buffalo, NY] 18 Sept. 1960: 9-B. Print. "Hospital Drive Committees Are Appointed." Buffalo Courier-Express[Buffalo, NY] 12 Oct. 1946: 17. Print. "Hospital Dedicated." Buffalo Courier-Express [Buffalo, NY] 26 Aug. 1960: 12. Print. "Hospital Fund Drive Lags, Report Finds." Buffalo Courier-Express [Buffalo, NY] 12 Dec. 1956: n. pag. Print. "Nuns Lauded for Hospital." Buffalo Courier-Express [Buffalo, NY] 26 Aug. 1960: 13. Print. "Positions Filled At New Hospital." Buffalo Courier-Express [Buffalo, NY] 13 Mar. 1960: 3-B. Print. "St. Joseph Hospital Fund Donations Total $569,580." Buffalo Courier-Express [Buffalo, NY] Dec. 1956: 19. Print. "St. Joseph Hospital Will Open on Sept. 8." Buffalo Courier-Express [Buffalo, NY] 28 July 1960: 8. Print.